After 25 Years she is making a storm across Australia and helping couples make their day even more special. With weddings, Funerals, Wedding Vowl Renewals and Special Celebrations such as house warming, Special Birthdays and much much more. If you have a special moment in your family coming up, why not contact her today for a quote and make your memories even more special. Sandy Bottoms Latest Release Of Sandy Bottoms Soapbox From September 2017 on Gay and Lesbian News Across the Globe and Australia’s Gay and Lesbians Plebicide. 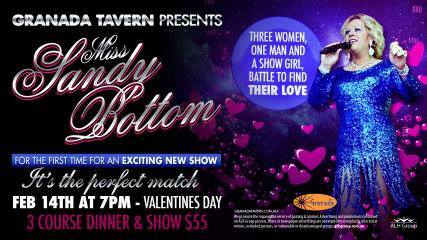 Join myself and all the Queens of Sydney for a little evening of Birthday Magic. Always felt you missed out on your special day, well here is the solution, have it again with me. Well have old music specials, Balloons, Cake and Stories to keep you all in the mood for a great night, and even pass the parcel makes its place to the venue. Dont Miss Out on a fun night. Tickets 9358 3848 and Choose from special menu or normal menu on the night. After a long period Im back on the Strip Once again in Sydney. Catch me in a new performance called Music Interludes as I share stories, music and match it with food. Located at the Shift Restaurant 91 Oxford St, for a great night in and lots more. For more information follow this facebook link. After almost three years of being on the Golden Gay Mile, Ive decided to come back with a vengeance. Featuring as much Elvis as you can stand, enough Humperdinck that any man could listen to, and the odd never heard of song, Ill spread the love with music, food and laughs. Join me on this special night but dont worry if you cant make it theirs more to follow. 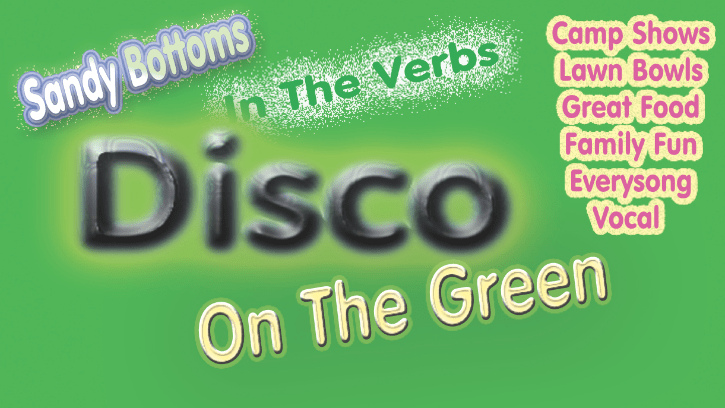 Hosted by Sydney’s most famous Transgender Illusionist, Sandy Bottom will be in town for another instalment for “Disco on the Green” (Verbs Style). She will be singing songs of yesterday with her Drag Queen entourage and camp international Dj’s. With Entertainment all day for every age there’s surprises including lawn bowling competitions, raffles and maybe the odd stray show girl and it’s all on the green. 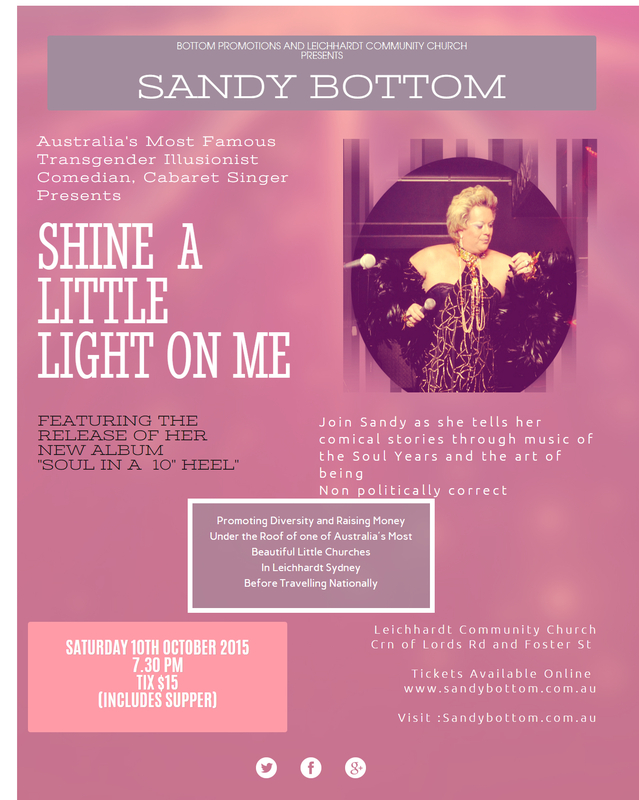 “Everyone can grab a bite to eat, sing, dance and enjoy all the fun that this day has to offer” says Sandy as she organises some of Sydney’s best and not so good talent to perform on the day. “This is a day for all the family, from all ages and all walks of life” says Sandy, “All you need is a sense of humour a few dollars for food and drinks and a set of disco hips to dance on the green”. All profits from this event will be donated to local GLBTI charities which is managed through the board of the club. So grab your disco shoes, and your sense of fun and join Sandy and her crew at the club.